CES 2015: Seiki to launch first Freeview Connect TVs | What Hi-Fi? 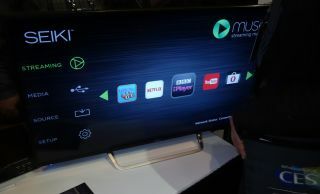 Seiki has announced it will be the first company to release Freeview Connect televisions in the UK, delivering both live Freeview channels and on-demand apps such as iPlayer and Netflix to internet-connected TVs. The Freeview Connect service was announced last year and aims to deliver live and on-demand TV from the key UK channels over the internet, while also giving access to the likes of Netflix and YouTube on the same platform. And it seems Seiki might just be the first manufacturer to market with Freeview Connect TVs, due out by Q3 later this year in a range of screen sizes from 32in to 50in. Seiki is calling its take on the smart TV interface 'Muse TV', and it should allow you to skip seamlessly forwards and backwards through the new Freeview Connect EPG as well as access on demand TV and film services, including BBC iPlayer. The company made its name with super-cheap 4K TVs but these sets will only be full HD resolution models for now, though a Seiki representative told What Hi-Fi? there would be 4K models to come later in the year. Seiki Digital is owned by Chinese company, Tsinghua Tongfang, has its HQ in the US and has recently expanded in to the UK with a factory in Port Talbot, Wales.